Holy Week and Easter form the heart of the Christian year, and they remember, observe, and celebrate the heart of the life and meaning of Jesus Christ. And what these Great Three Days of Maundy Thursday, Good Friday, and Easter reveal to be at the heart of Christ is, it seems to me, this: vulnerability. Maundy Thursday, during which we remember the Last Supper of Jesus with his disciples, reveals Christ making himself vulnerable by offering to us his very life through the mystery of Communion or Eucharist. The life of Christ, the spiritual energy of the Lord, is made available to us in the blessed bread and wine. For me, this is the true pouring out of Christ’s life for us and for the world: that Jesus pours out his life in order to make all that he is available to us. His willingness to make himself vulnerable in this way empowers us to similarly offer ourselves for others, embodying the “new commandment” that is also remembered on Maundy Thursday, that we should love one another as Christ loves us. 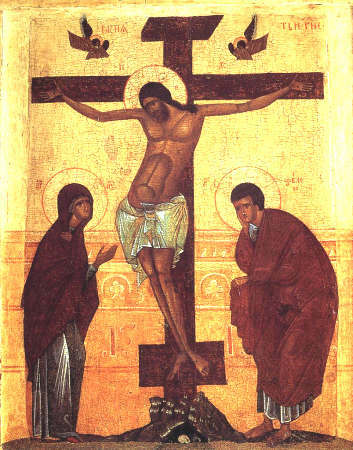 The crucifixion of Jesus, remembered on Good Friday, is the most profound example of Christ’s vulnerability. Jesus voluntarily enters the vulnerable space created by the twisted machinations of powerful people. In so doing, he offers up his life for us. Not in the sense of sacrificing himself to a demanding God, but in the sense that in voluntarily stepping into that place of utmost vulnerability, Jesus shows us who we are when we are at our worst, when we live only from a place of ego and fear rather than from a place centered in God. Jesus becomes the willing, innocent victim — an icon of all the unwilling victims human beings constantly create — in order to show us that we do not need to be run by fear, victimizing, and scapegoating. The Resurrection shows us that by voluntarily inhabiting the vulnerable place of the victim, Jesus unleashes a power that is greater than death, and by so doing unmasks death as a paper tiger, as something which we do not have to fear. Our lives do not have to be lived in the shadow of death and the fear which it engenders in us. Instead, we see in the Risen Christ that God is a God of life, not death, and that ultimately nothing can take this life away from us. In Christ, we see that when we open ourselves to vulnerability, we open ourselves to the power and life of God. This power of God is not a power which glorifies and dominates, but a power of deep connection to our true self, to God, to other, and to all of creation, a power that leads to service and compassion, a power that is ultimately not about “me” but about “us” as a human family. As we move through these next days and finally arrive at the celebration of Easter, may we allow Christ to lead us into vulnerability, that we may discover the deep life, power, and love of God. As we approach the start of Holy Week, we can see the glimmer of Easter on the horizon at the other end of that week. After five weeks of Lent, people are probably looking forward to the outburst of joy that comes with Easter Day. It is, after all, the heart and soul of the Christian faith and year: the Resurrection of Christ. We know, from a careful reading of the New Testament, that it was also the heart of the early Christian message: Christ is Risen, and he has appeared to Simon (and, before that, to a group of women, along with other disciples). In the context of early Christianity, before people got interested in stories of Jesus’ birth, it was the Resurrection that made Jesus the Christ. Of course, in order for there to be a resurrection, a death must first occur. And, so, we have Palm Sunday and Good Friday which unfold the terrifying time encompassing the arrest, trial, and crucifixion of Jesus. And it is the crucifixion of Jesus that has proven to be a rather significant stumbling block in the Christian tradition. While the church, over the centuries, has not hesitated to put forth numerous doctrinal statements and definitions covering a multitude of aspects of the mystery of Christ, it has not been possible to be definitive and clear about the theology that should attach to the crucifixion. Christians, I think, came to be haunted by the death of Jesus, as we are and should be haunted by the unjust and tortuous death of any human being. In the face of death that seems senseless and unfair, human beings have a deep longing and need to make the senseless sensible. We cannot help ourselves asking, “Why?” And we cannot help ourselves trying to supply an answer to give meaning. Probably (and, in my estimation, most unfortunately) the most popular attempt to make sense of the death of Jesus has become what is known in theological circles as the theory of substitutionary atonement. According to this theory, the ability or willingness of God to forgive human beings depends on the offering of a sacrifice. The ancient Jewish people practiced animal sacrifice in order to obtain such forgiveness, and the theory of substitutionary atonement basically makes Jesus the sacrifice par excellence to obtain God’s forgiveness — the sacrifice that ends all sacrifices. But this notion that God cannot or will not forgive in the absence of some sort of sacrifice is a difficult position, and raises a host of questions about God and the relationship between God and humanity that cannot easily be dealt with. Theological libraries are littered with books that attempt to do so. If one spends enough time exploring the dark streets and back alleys of atonement theology, it can easily start to seem that the crucifixion is the central Christian mystery, rather than the resurrection. And, for me, we get ourselves immersed in unnecessary complexity. The crucifixion of Jesus can be greatly simplified and clarified — and become much less a stumbling block — if we stop insisting on seeing it as a divine necessity and, instead, begin seeing it as a human tragedy. Jesus did not die because God needed him to. Jesus died because human beings exclude, marginalize, scapegoat, and kill those whom we cannot understand or who seem to us to be threatening in some fundamental way. The life and being of Jesus was itself a stumbling block for ancient Jewish religious leadership and ancient Roman civil authority, and the result of the tension created by the life and teaching of Jesus was that threatened human beings in positions of power brought about his death. They made him a victim, no doubt believing that by so doing they were serving some higher interest. The crucifixion demonstrates a dark human tendency that has made a victim not only of Jesus, but of countless human beings over the centuries. The recognition of the crucifixion as a human tragedy which made Jesus a victim radically transforms the role of God in that event. Rather than being the One who demands Jesus’ death, God becomes the One who, in Jesus, becomes the victim. In Christ, God chooses to occupy the space of the victim. And, having become the victim, God transforms the victim space by the light of Resurrection, exposing it for what it is but also declaring its deathly power null and void. Perhaps the fact that it is so hard for people of faith to accept the crucifixion as a human tragedy rather than as involving some divine necessity or protagonism underscores how unwilling we are to acknowledge the darker streets and back alleys of our own humanity. I copied this image, and its text, from a posting that I saw on Facebook this week. The photo is intended, it seems, as a general commentary on religion, and the message is very clear: religious leaders/authorities/institutions have “fabricated” God and manufactured a belief system to go with it, in order to manipulate people into doing their will. The question with which viewers are left, “Who does that?” invites, I think, the reader to conclude that all religion does that — and, thus, perhaps religion should be left behind, along with the God that it “fabricated”. On the one hand, the image with its text offers us an important insight that we should pay attention to and never forget: that religion, as it has been developed and practiced among many people and within many institutions, has indeed become manipulative. The theologian James Alison, for example (and, yes, I’m on an Alison kick these days), suggests that what has come to be the traditional interpretation of the Crucifixion of Jesus, as a sacrifice required by God in order to forgive our sins, is a piece of emotional blackmail under a religious guise. It attempts, he suggests, to impose a certain guilt on us by encouraging us to think about Jesus as having been forced to die for our sins. And that guilt is, indeed, intended to manipulate. There are countless other examples within the Christian tradition, certainly, of religious authorities using religion to manipulate people and impose their will. This was, indeed, one of the principal objections voiced by Jesus about the Judaism of his time: that the religious elite were constantly using their position and authority to manipulate others. Recognizing the power of religion to become a tool of manipulation should make us cautious. And when religion is conceived of primarily as being about beliefs, morals, and behaviors, the possibility of manipulation is rampant. It seems right to me to say clearly and forcefully that authentic religion, we might say true religion, is not manipulative. And where two or three are being manipulated, Christ is not being made manifest — though Christ might well show up to try to subvert the manipulation. 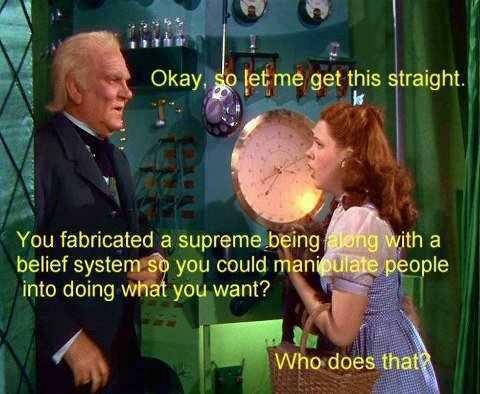 By using the term “authentic religion” or “true religion”, however, I am clearly suggesting that there is religion that is not manipulative, religion that does not correspond to what this image of Dorothy and the Wizard with its accompanying text seeks to convey. People forget, sometimes, that the world’s religious traditions did not come into being as the result of a conspiracy of elites to gain power and control others. While nearly every religion has suffered corruption at the hands of people who do harbor such ambitions, the kerygma or core of each of the world’s religious traditions is rooted in a real, authentic human experience — an experience so powerful that it opened up the people who had the experience in a way that they had never been opened up before, and convinced them that they had experienced that which we seek to capture in words like God, Sacred, Transcendent, Holy. And, of course, those words are utterly incapable of describing the experience. These experiences were not really about doctrines, beliefs, or morals, but rather, about transformation and the shifting of paradigms. What is clear is that these experiences that gave rise to what would become religious traditions were sufficiently powerful as to utterly change the lives of those involved. The history of all religions is full of examples of people who made tremendous sacrifices in their lives for the sake of what they had experienced. The difficult task faced by every religious tradition, however, is the task of somehow passing on that original experience or, to be more accurate, the task of inducting people into that experience. In the case of Christianity, for example, the task faced by the first Christians was to somehow induct people who had not personally witnessed the Risen Christ into the experience of the Risen Christ. Everything that the church does is (or should be) about that one goal: inducting people into the experience of the Risen Christ. All of our traditions with respect to prayer and worship are about this very task. Inevitably, however, the task of inducting subsequent generations into the original experience gets muddied. Sometimes, it gets modified and shifted in appropriate ways to meet new cultures. Often, however, it gets corrupted in various ways as it passes through various cultures and, it must be admitted, through the hands of people who are untransformed and who twist the tradition into a means of power and control — and there we are at manipulation again. 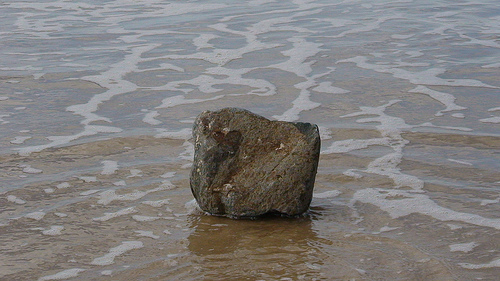 All of this is to say that God, the Sacred, the Holy, the Transcendent — is not invented. Though, people do invent things about God that are more reflections of an untransformed human consciousness than a manifestation of the divine. To jettison religion as nothing more than fabrication with the intent to manipulate would be folly, and would do violence to the original experience that so powerfully moved the founders of our traditions. It would also betray the natural human movement toward the transcendent, present in every human being (I am convinced) but not always manifested in what we would call a religious way. However, to approach religions and their representatives as if they were infallible or without error would also be folly. The various religious traditions must always be self-critical, asking whether a given practice, teaching or belief truly serves to induct people into the original experience and, therefore, into deeper relationship and transformation. If it does not, than it must be questioned. And, often, we are more able to undertake this task of self-criticism when we are challenged by those outside our tradition who wonder whether we have anything real to offer, or if it really is just all made up.